The Center for HOPE welcomes author Mary Cregan as the speaker for its 2019 Annual Luncheon on Wednesday, May 8. The event will begin at 11 a.m. at Wee Burn Beach Club, located at 6 Anchor Road in Rowayton. In her new book, The Scar: A Personal History of Depression and Recovery, Cregan recounts her long-term battle with mental illness and the tenacity she found within her self to rebuild her life from the ground up. Shortly after the death of her newborn daughter, Cregan sank into a depression so deep she required hospitalization. A failed suicide attempt while admitted to a locked unit was the low point of her long and arduous path to recovery. The scar from that suicide attempt serves not only as a reminder of her darkest days, but also how far she has come. Using her medical records, notebooks from the time, her own memories and those of people close to her, Cregan discusses the treatments she received while hospitalized, the stigmas that still cling to depression and suicide, and the medications that have transformed the landscape of mental health. 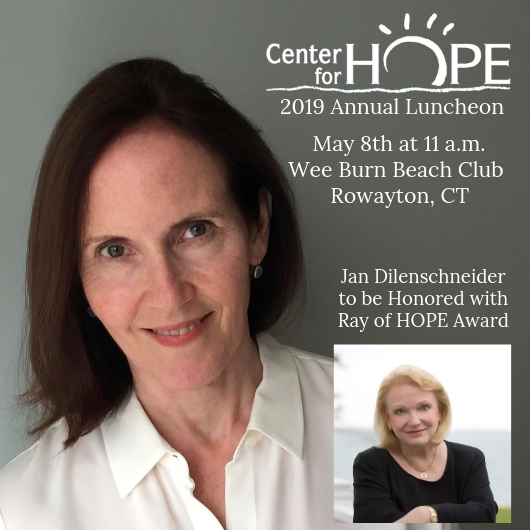 Longtime Family Centers Board Member and former Board Chair Jan Dilenschneider will also be honored with the "Ray of HOPE Award." For many years, Dilenschneider has made Family Centers and the Center for HOPE her primary philanthropic interests. In addition to serving as Family Centers' Board Chairman from 2005-2008, she co-chaired numerous successful special events, provided guidance on service delivery and helped enhance the public profile of the organization. All proceeds from the 2019 Center for HOPE Luncheon will benefit the Center for HOPE and The Den for Grieving Kids, Family Centers’ programs offering counseling and support to residents of lower Fairfield County coping with a loss, a critical illness or life-altering circumstance. As the event's lead sponsor, Family Centers will work with you to create a comprehensive sponsorship package built around your unique needs. - Twelve copies of Mary Cregan's book, "The Scar"
- Ten copies of Mary Cregan's book, "The Scar"
- Eight copies of Mary Cregan's book, "The Scar"
- Six copies of Mary Cregan's book "The Scar"
- One copy of Mary Cregan's book, "The Scar"
- One copy of Marry Cregan's book, "The Scar"
Can't make the Center for HOPE Luncheon but would like to make a donation? You can do it here!